Very often, this series reiterates that the black and white notions of “working mother” and “stay at home mother” are outdated and the blended space between is vast. Today’s feature, the talented jewelry designer Karina Rousou, brings to life that in between. She sums up elegantly the push motherhood gave her to take risks otherwise avoided to find fulfillment and a version of balance. 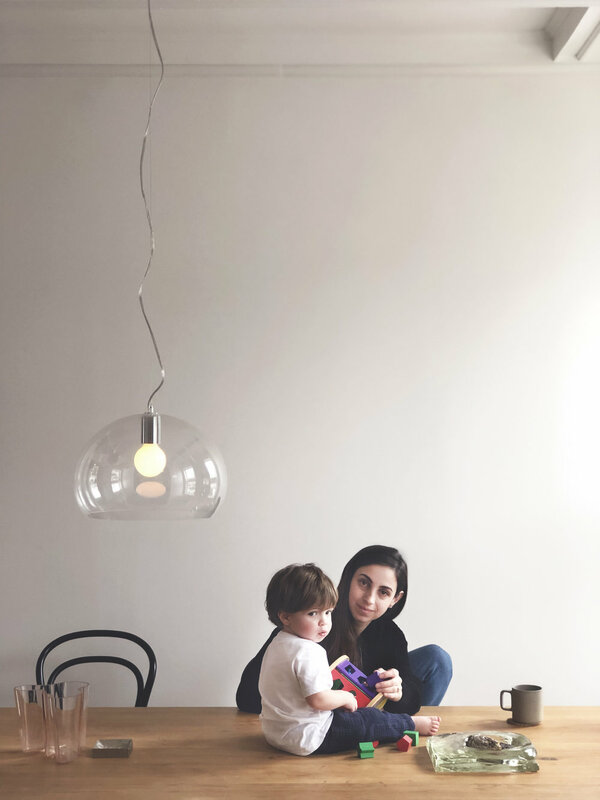 Below, Karina offers a mix of inspiration and precise detail on how she stepped away from her full time work, embraced her “side project” in its place and set up her weeks to make room to be present for her son and herself and her beautiful business. While becoming a mom has definitely made me more vulnerable and anxious, I’ve actually noticed one amazing and unexpected positive change. Before becoming a mom, I was always a ‘yes person.’ I felt a strong need to please everyone and oftentimes at my own expense. Now, my values have become a lot more clear, so I find it easier to concentrate on the people and things that matter most to me. I’ve eliminated a lot of the extra noise that was lingering around me pre-motherhood, so now if something’s not working for me - whether it be a friendship, an aspect of my career, an old habit, etc., I’m much more inclined to say ‘no’ or make a change. Part of it is that my time has become much more precious, so I have no choice but to trust my instincts more and make quicker, informed decisions without the time to constantly analyze everything. It’s refreshing! It’s a bit like childhood- when inhibitions and fear of failure didn’t hold me back. I left my job to start my own business. Contrary to what I thought, being a mom has actually given me the push I needed to take risks in life professionally. It’s made me more eager to build something that I am not only proud of, but that can also afford me a little more flexibility in my schedule to spend more time with my son. Prior to having him, I had a full-time job and a side business that was gaining some traction. Thinking I could do it all, I continued with both postpartum, but the weight of all of the responsibilities was overbearing and it just became completely unsustainable. The physical and mental space I needed to be the best mom I could be was being consumed with work, so after spending some time crunching numbers and figuring out what my new schedule would look like, I dove in and started full-time on my custom jewelry business, Karina Noel, at the beginning of this year. I now typically work from 9-4:30 pm Monday-Thursday and take half days on Fridays to have mommy/son time before the weekend. Patient, playful, and admittedly a bit neurotic, but I’m working on it! I read somewhere that self-care is not a luxury, but a necessity, and that could not be truer. Since I work for myself now, I have a lot of alone time where I’m focused on work, and I take advantage of the ‘in-between’ times to recharge - the walk home from daycare sans phone where I’ll just take in my surroundings, the commute into Manhattan where I’ll read a book, or the occasional car ride listening to podcasts. Those moments are enough for me right now. But in my experience, the real challenge has been taking care of myself within motherhood. Having my son was the most beautiful and rewarding thing I’ve ever done, but it was also the most difficult. After giving birth, I struggled with my new body and new identity and was quite hard on myself for a while for not feeling anything but fulfilled and grateful. So, I like to think that the most important type of self-care is letting go of the weight and constant self-judgment of ourselves as mothers - to give ourselves grace. It’s funny because the paradox of it all is that the things I judge myself on in motherhood - Am I feeding my kid the right food? Is he thriving like the other kids his age? Am I present enough? Am I creating enough order? - are the very things that make me most anxious. Self-care for me is not carrying that weight - because when I find myself in those moments where I do let it go, I am the best version of myself and therefore, the best mother to my son. I encourage myself and all of the mamas out there to take some of that immense love you have for your child (which inevitably comes with all of that worry) and use some of it for ourselves. I love this question because when I had my son I remember being so curious about literally every parent’s work/life balance. I wanted to know how the heck they made it work for them. Every response was different, but each one helped me to realize that there is no ideal situation - you do what works for you. For me, I don’t have much family who lives close by, so I heavily rely on childcare. When I went back to work 3 months postpartum, I found a wonderful nanny who was with us full-time for a year. She was amazing - she helped with meals, showed up when my son was sick and never had an issue staying late if I needed her to. Now, my son is in daycare full-time and it’s working out well for us. He has become a little social butterfly (he’s 20 months old) and is learning so much. For babysitting, I rely on local friends and my rockstar sister who doesn’t live close but comes to see us often. And for added sanity, I’ve splurged on the occasional house-cleaning - it’s worth every penny. Other than that, I owe my husband a shout-out because he does a lot for our family. I’m so lucky to have him as a partner on this crazy ride. Besides perpetually trying to simplify my life and get more organized, I am really working on being direct with others about my needs, rather than passive aggressive and trying to do it all. I'd like to get better at asking for help and feeling grateful that I have that help available to me. Favorite product, tool, or app for parenting life? I'm currently loving Beautycounter for kid’s bath & body products - all natural. Ideal date night: I had an amazing meal at Al Di La in Park Slope, Brooklyn recently. The ambiance was perfect for a date and they make a killer Negroni. A mother you’re inspired by: My sister-in-law. She’s a stay-at-home mom with 4 kids and does it all by herself!